Ive shared information on a number of sites and tools that can help you keep up with RSS feeds, but maybe you want something simpler to help you keep up with a blog or podcast. FeedMyInbox is a fast, efficient web-based tool that may be just what youre looking for. The tool is so simple that Ill walk you through the 5 steps it takes to set up. But first, let me explain that the site does for you. You find a blog or a news site that you want to keep up with. 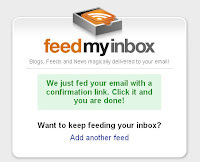 Enter some information on the FeedMyInbox site, and that blog's entries will show up in your email inbox. Perhaps you just dont want to add another tool to the list of things you keep up with. It could even be the case that you are all set up with FriendFeed and AtomKeep, but there are a few feeds you need to make sure that you see as soon as theyre published (for instance, the blog of a friend or colleague, district school closing information, university security announcements). In the classroom, you might be looking for an email alternative for families and students who sometimes forget to visit the class blog where you post assignments and updates. FeedMyInbox can take care of all these situations. You enter your information and forget about it. The feed for that blog post or newspaper will come to your inbox just like any other email message. Let me show you how simple it is. You can click on any of the images below to see a larger version of the screenshot. Identify a blog or another site with an RSS feed that you want to follow. I'm going to use this blog as my example. 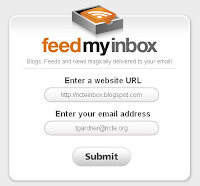 Go to the FeedMyInbox website and enter the address of the blog and the email address you want to receive the updates, and click the Submit button. Youll see a message telling you to go check the email account that you entered for a confirmation message. Open up the email message and click the confirmation link, and then save this message for later. You can reply to it in the future if you need help. Youll see a message telling you that the feed has been added. Thats it. The next time the feed youve subscribed to is updated, youll get details in your email inbox. Its simple. It requires no extra downloads and no additional websites to keep track of. Once youve set it up, youre done. Slick, huh? Last week, I talked about websites and software that can help you keep up with your colleagues all in one place. These social aggregators collect updates from a variety of social networks (like Facebook and Twitter) and present them all on one organized webpage. Set one up, and you easily keep up with what your friends, family, and colleagues are saying online. Thats only half of the challenge of social networking though. What can you do to make sure that everyone sees what you have to say without visiting a dozen social networking sites? Social aggregators can help you here too. Many of the tools that I mentioned last week not only allow you to read updates from all your friends in one place but also allow you to post updates to multiple sites. You write one updates, and the social aggregator pushes that update to all the networks you want. If youre primarily interested in microblogging, for instance, a tool like Twhirl will allow you to post your 140-character update to your account at three different sites—Twitter, Jaiku, and Pownce. Youll find other aggregators that allow you to both read from multiple sites and post the same update to those sites. The most universal tools Ive found are Ping.fm and AtomKeep. Ping.fm is to posting your updates what FriendFeed is to reading details from all your social networks. Once youve signed up for an account on Ping.fm, you can post a single update to over twenty different social networks, including Facebook, MySpace, Blogger, and Twitter. Settings in Ping.fm keep track of whether a network only posts microblog updates, status updates, or full blogs. And not only does this site streamline and organize the way you post updates to your friends and colleagues, Ping.fm allows you to send you posts by instant messages, from your cell phone, and from a Facebook application in addition to sending your posts from the Ping.fm website. Its a great tool for simplifying the way you keep in touch with everyone. The site is still in its beta stage, so you need an invitation code. Use code “vivalaping” to get started. Now that youve simplified the process of posting updates, what do you do when your homepage address needs to be updated on all those social networking sites? Who wants to visit all of them just to change that information in a profile. Heres a secret: Set up AtomKeep and you wont have to. You just enter your profile information on the AtomKeep site, and then you can sync your details with nearly thirty different websites. You may be worried about security, but no worries there. The site is not automatic. You tell it when to update another site, and you must enter your usersname and password each time, so your profiles should stay relatively safe. A word of caution: pay attention to the details that you enter for your profile and where you update. You may have a private website that you do not want to share on Facebook, for instance. AtomKeep has no way of knowing to exclude that website when it syncs things for you. The best rule of thumb is to only put information in AtomKeep that you would post on every site you add to your account. So there you have it—FriendFeed from last weeks post and Ping.fm, and AtomKeep this week. Together the three sites should make it far easier to keep up with the Web 2.0 world. Theyre all web-based and all free. Set them all up now, and youll be able to keep up with friends, family, and colleagues even when youre busy in the classroom this fall! This summer, Im exploring a variety of Web sites and tools that you can use in the classroom and/or for your own professional development. Each week, Ill talk about how it works, point out related sites, and discuss classroom connections. This week, I focus on social networking aggregators, tools that streamline the time you spend on social networking sites. And if youre not sure what social networking is, the Common Craft Show has a fast video explanation that will make it all clear. Time to get caught up on what your colleagues are doing? That means you need to check all your friends on Facebook, MySpace, LinkedIn, Ning, Twitter, Pownce, Jaiku, Blogger, LiveJournal, Digg, YouTube, Flickr, Plurk, Technorati, and delicious. Just the thought of all that is overwhelming, and its likely to take the entire evening to get all those sites checked—and thats if you re lucky. Some nights you only get through two or three of the sites before you run out of energy and head to bed. While 8Hands is a tool you download, there are plenty of social network aggregators that you visit using your web browser. Friendfeed is one of the more popular of these sites. Friendfeed gathers postings from over forty different social networking sites, including blogs, image sharing sites, social bookmarking sites, and microblogging sites. Friendfeed creates a single RSS feed from all those sites, allowing you to view everything in one place. If youd like more organization for your social network aggregator, you might try SecondBrain. Not only does SecondBrain aggregate twenty-five sites, but it also allows you to arrange the information in folders, or collections. SecondBrain is still in beta and is a bit clunky, but its ability to categorize your networking sites may make this site useful in the future. For my own connections, Im sticking to Friendfeed for now. There are numerous other sites and tools out there though. For more alternatives, check out The 19+ Social Network Aggregator List from MakeUseOf and 20 Ways To Aggregate Your Social Networking Profiles from Mashable. And come back next week, when Ill talk about how aggregator sites can streamline the way you post information to friends and followers in your social network. This summer, Im exploring a variety of Web sites and tools that you can use in the classroom and/or for your own professional development. Each week, Ill talk about how it works, point out related sites, and discuss classroom connections. This week, I focus on a variety of online resources for mind mapping. If youre unfamiliar with this graphic organizer, be sure to check out How to make a mind map® in 8 steps for some tips. While the page refers to a specific software program, the general information in the tips can be applied to any way of making mind maps, even old fashioned pencil-and-paper techniques. Some of these tools include more sophisticated resources, but all include the most basic tools you need. If your school or district policies require that you use a tool that does not include a login, try the ReadWriteThink Webbing Tool. For example maps you can share with students, be sure to visit TopicScapes Directory of Mind Maps, which points to maps specfically on literature. Mappio provides a wider variety of example maps. The site allows visitors to upload and share their own maps as well. Both sites are directories. In other words, they point to maps on third-party sites. Many of the literature examples are on the Inspiration website for instance. The maps at these two example sites are often more sophisticated than the free tools will allow students to create, but they do show the range of options for mapping well. Even if you choose not to have students do mind mapping in class, these example sites point to resources that you might use as you teach specific topics. The Inspiration Map on Wordworths “I Wandered Lonely as a Cloud” can provide plenty of places to begin discussion and inspire analysis. The Shakespeare Biography Mind Map could be used to organize an overview of the playwrights life or as a resource as students analyze and explore Shakespeares works. The Poetry Mind Map can structure analysis and discussion of any poem as well as provide scaffolding for students as they review poetry independently.